Background Alopecia areata (AA) is an autoimmune disease characterized by a localized patchy hair loss from scalp and other hairy body parts. The association of abnormal levels of vitamin D in patients of AA is controversial. Assessment of serum vitamin D depends on measurement of 25 hydroxy vitamin D [25(OH)D], not measuring the active form 1,25 dihydroxyvitamin D.
Objectives The aim of the study is to measure serum 25(OH)D levels in patients with AA and to correlate them with the severity of the disease. Patients and methods A total of 20 patients with mild to moderate (AA) and 20 healthy persons as controls were involved in this study. Serum 25(OH)D levels of both patients and normal controls were assessed using electrochemiluminescence. Severity of Alopecia Tool (SALT) score was calculated for all patients with AA involved in this study. Serum values of 25(OH)D in patients with AA were compared with the values in the healthy controls. Correlation was done between SALT scores and serum levels of 25(OH)D in the patients with AA. Results Serum 25(OH)D levels were significantly lower in the case group in comparison with the control group. In this study, we found a significantly higher SALT values in correlation to the deficient serum 25(OH)D levels in the case group. Conclusion Deficient serum 25(OH)D may be a serum marker of increased severity of AA. Alopecia areata (AA) is an autoimmune disease resulting in nonscarring hair loss. Many autoimmune diseases are associated with reduced vitamin D levels, such as rheumatoid arthritis, type I diabetes mellitus, and multiple sclerosis. Vitamin D analogs are also used as topical therapies for some cutaneous autoimmune diseases such as psoriasis and vitiligo . Vitamin D is either formed in keratinocytes under the effect of ultraviolet B rays or taken in diet and dietary supplements. Vitamin D from both sources is converted in the liver to 25 hydroxy vitamin D [25(OH)D] and then in the kidney to 1,25 dihydroxyvitamin D [1,25(OH)2D], the active form of vitamin D. Normally, the main source of 1,25(OH)2D is the kidney, and its serum level is regulated by changes in serum calcium, phosphorus, fibroblast growth factor-23, and parathyroid hormone . It was found that many tissues (e.g., bone, prostate, breast, colon, and immune cells) express 25(OH)D-1-α hydroxylase that converts 25(OH)D to 1,25(OH)2D locally. These local effects cause decreased cellular proliferation, increased cellular differentiation, and cell survival. The importance and of peripheral conversion of 25(OH)D to 1,25(OH)2D relative to its systemic production is difficult to assess, and nothing is known about the effect of impaired peripheral conversion on the serum level of 25(OH)D .
The active form, 1,25(OH)2D is an immunoregulatory factor as it regulates both innate and adaptive immune responses, and it modulates the activities of both T lymphocytes and B lymphocytes. The functions of 1,25(OH)2D in the skin are mediated through vitamin D receptors. These receptors are normally expressed in skin at two sites: keratinocytes and mesenchymal cells of dermal papillae . The lack of vitamin D receptors expression in skin is associated with defect in hair follicle growth with the result of hair disorders. It was also found that patients with 1,25(OH)2D-resistant rickets type II may represent with alopecia totalis . Assessment of vitamin D status is not based on measurement of serum 1,25(OH)2D levels as they are relatively low and firmly regulated. Measurement of serum 25(OH)D is preferred as it is the most stable and plentiful metabolite of vitamin D in human serum and has a half-life of 3 weeks . Many authors define vitamin D deficiency as serum 25(OH)D level below 20 ng/ml and vitamin D insufficiency as less than 30 ng/ml . A total of 20 patients with mild to moderate AA and 20 healthy persons as control were involved in this study. Informed consents were obtained from all participants in this study.An approval of the institutional reviewer board(IRB) was obtained. Serum 25(OH)D levels of both patients and normal controls were assessed using electrochemiluminescence (Elecsys ; Roche Diagnostics, Indianapolis, USA). We considered vitamin D deficiency as serum 25(OH)D below 20 ng/ml and vitamin D insufficiency as serum values less than 30 ng/ml and above 20 ng/ml. Severity of Alopecia Tool (SALT) score was calculated for all patients with AA involved in this study . Serum values of 25(OH)D in patients with AA were compared with their values in the healthy controls. Correlation was done between SALT scores and serum levels of 25(OH)D in these patients with AA. Data were imported into statistical package for the social sciences (SPSS, version 20.0, IBM, Armonk, NY, USA) software for analysis. There was no significant difference regarding age between the case and the control groups. They were age matched. Serum 25(OH)D levels were significantly lower in case group in comparison with the control group ([Table 1]). We found a higher significant SALT values in correlation to the deficient serum 25(OH)D levels (below 20 ng/ml) in the case group ([Table 2]). We found a higher SALT scores in patients with AA with insufficient serum 25(OH)D in comparison with patients with sufficient serum levels (less than 30 ng/ml and more than 20 ng/ml) but with nonsignificant correlation ([Table 3]). During this study, we found a significant negative correlation of serum 25(OH)D levels in correlation to SALT scores in patients with AA in the case group ([Figure 1]). 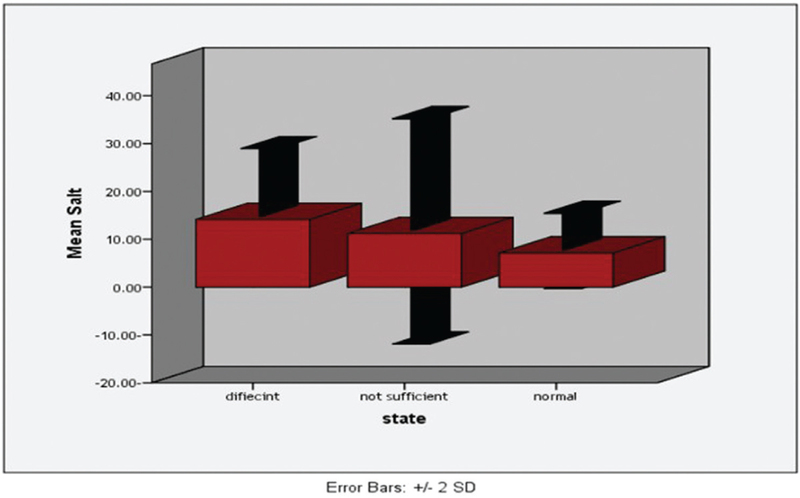 Figure 1 Bar chart showing mean SALT scores in relation to serum 25(OH)D levels in the case group (whether deficient, insufficient, or normal). 25(OD)D, 25 hydroxy vitamin D; SALT, Severity of Alopecia Tool. AA is an autoimmune T cell-mediated disease . Vitamin D inhibits T lymphocytes, especially T helper 1 cells and T helper 17 cells. Vitamin D increases the production of regulatory T cells and enhances their inhibitory functions, which have an important role in self-tolerance and prevention of autoimmunity . Vitamin D is one of the main players affecting the hair follicle. Many studies report vitamin D deficiency in many hair disorders. We assessed serum values of 25(OH)D in patients with AA and correlated them with SALT scores of those patients. In this study, we considered vitamin D deficiency when serum 25(OH)D was less than 20 ng/ml and vitamin D insufficiency when serum 25(OH)D was less than 30 ng/ml and more than 20 ng/ml. A total of 20 patients with mild to moderate AA and 20 healthy persons as controls were involved in this study. Serum 25(OH)D levels of both patients and normal controls were assessed using electrochemiluminescence (Elecsys, Roche Diagnostics). We found that serum 25(OH)D levels were significantly lower in the case group in comparison with the control group. This goes with a study by Mahamid et al. . Within the case group, there were no significant differences regarding serum 25(OH)D levels (whether deficient or insufficient or normal). This may mean that vitamin D deficiency and/or insufficiency may not be a predominant cause of inducing or enhancing autoimmunity in patients with AA. We found a higher statistically significant SALT values in correlation with the deficient seum 25(OH)D levels in the case group.In this study, SALT scores in patients with AA with insufficient serum 25(OH)D were higher in comparison with patients with sufficient serum levels but with nonsignificant statistical correlation. Generally during this study, we found a significant negative correlation of serum 25(OH)D levels in correlation with SALT scores in patients with AA in the case group. This goes with the results of Aksu et al. .
Vitamin D deficiency and/or insufficiency may not be a predominant cause of inducing or enhancing autoimmunity in patients with AA. Deficient serum 25(OH)D − not the insufficient − may be a serum marker of increased severity of AA. Kriegel MA, Manson JE, Costenbader KH. Does vitamin D affect risk of developing autoimmune disease? A systemic review. Semin Arthritis Rheum 2011; 40:512–532. Gallagher JC, Sai AJ. Vitamin D insufficiency, deficiency, and bone health. J Clin Endocrinol Metab 2010; 95:2630–2633. Yilmaz N, Serarslan G, Gokce C. Vitamin D concentrations are decreased in patients with alopecia areata. Vitamins Trace Elements 2012; 01:1–4. Kennel KA, Drake MT, Hurley DL. Vitamin D deficiency in adults: when to test and how to treat. Mayo Clin Proc 2010; 85:752–757; quiz 757–758. Elise A, Olsen MD, Douglas Canfield BS. SALT II: a new take on the Severity of Alopecia Tool (SALT) for determining percentage scalp hair loss. J Am Acad Dermatol 2016; 75:1268–1270. Gorman S, Kuritzky LA, Judge MA, Dixon KM, McGlade JP, Mason RS et al. Topically applied 1,25 dihydroxyvitamin D3 enhances the suppressive activity of CD4+CD25+ cells in the draining lymph nodes. J Immunol 2007; 179:6273–6283. Mahamid M, Abu-Elhija O, Samamra M, Mahamid A, Nseir W. Association between vitamin D levels and alopecia areata. Isr Med Assoc J 2014; 16:367–370. Aksu Cerman A, Sarikaya Solak S, Kivanc Altunay I. Vitamin D deficiency in alopecia areata. Br J Dermatol 2014; 170:1299–1304.